It’s that time of year where men sit around all weekend, vegging out in front of the television, watching nothing but football. In this household, I could care less about football if it weren’t for my husband. He’s more of a college football man than a pro football man. He already has plans this week to uncase his beloved Ohio State Buckeyes flag and proudly display it underneath the American flag in front of our house. Why do men get so wrapped up in this game?! Alas, I digress. Because he loves this gridiron game so much, I at least tolerate it. What exactly does “tolerate it” mean? My tolerance level reaches kick-off foods I prepare for my husband and I watch at least 3-1/2 to 4 minutes of the game. Then its off to serving the internet because he refuses to talk to me. I usually find him yelling or cheering at the television. He’s so passionate about this game. Where was I? Oh, right, kick-off foods in the Instant Pot! One of the favorite kick-off foods to prepare is chili and chili dogs. 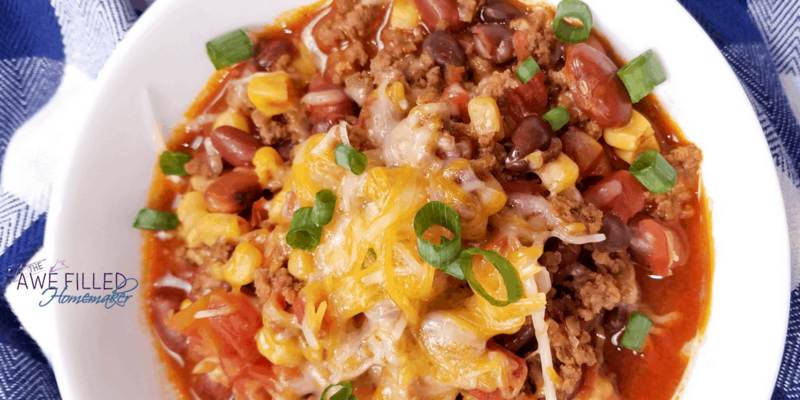 You can read more fascinating facts about chili HERE. There are many legends surrounding chili that I had no idea existed! 2 cans of Mexican corn or you can use fresh. I used some I had canned the previous season. First I get the instant pot out and ready to go. usually add in some seasonings like garlic, pepper, and my go to seasoning from the Loveless Cafe. Once the beef is browned I strain the grease off. 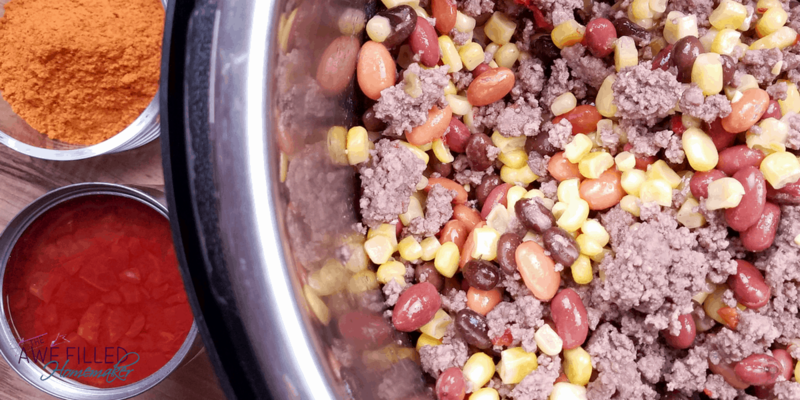 Rinse the beans well and dump in with the ground beef. Ad in the corn, taco seasoning, tomatoes, and beef stock. Stir it all well! Push high pressure for 15 minutes, NPR! Garnish with green shredded cheese and green onions, if you wish. 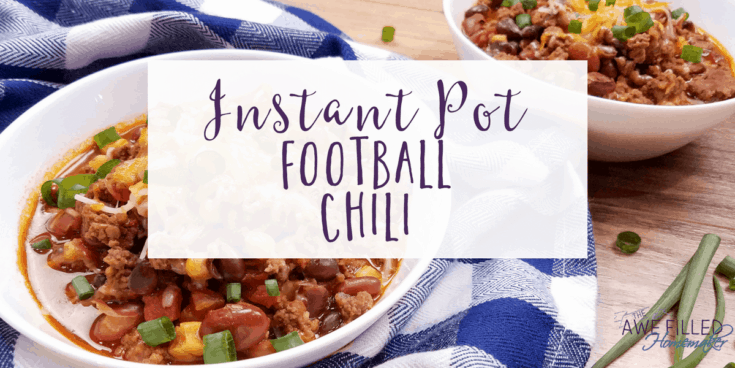 Laura's Football Chili for Instant Pot! Add the beef to the instant pot. Rinse the beans. I just dump them all in together to rinse. 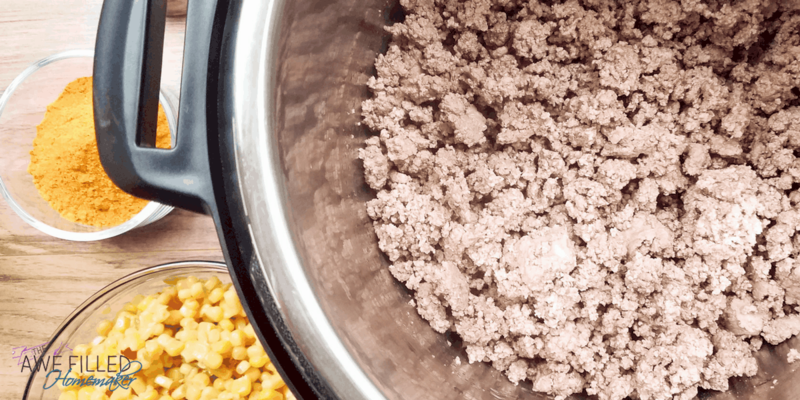 Add beans back to the Instant Pot and stir with the meat. Add in corn, taco seasoning, tomatoes, and beef stock. Stir well. Push the chili setting on normal and that's it! Previous Post: « Handwriting Through The Bible: Join is THIS September for the launch! 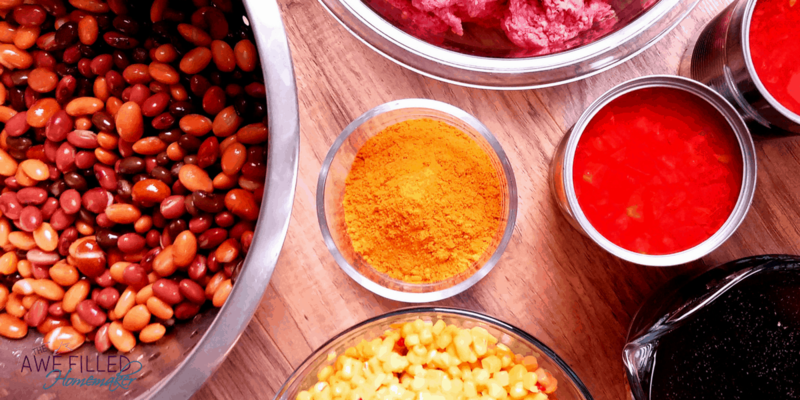 Do you drain the corn, beans, and tomatoes? I did drain the beans. The corn I personally use is corn I preserve (freeze) each summer and I do not drain it as there is no liquid. If I use canned, then I do drain. I do not drain the tomatoes.